Shkedi's Camplodge can provide group meals, guided Jeep tours in an air-conditioned desert vehicle, as well as other group activities. These services require advance booking. 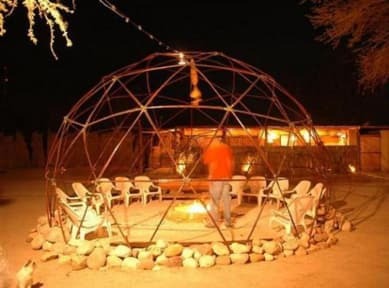 Shkedis CampLodge is located south of the Dead Sea, and is ideal for hosting backpackers, families and small groups. We offer private wooden cabins and stylish bungalows (dorms & private). You are bound to have a unique experience in a place that cherishes and compliments nature and the beautiful atmosphere of the desert. Shkedi's camplodge offers 2 private wooden cabins, suitable for a 2-5 people (couples, families and more). The air-conditioned cabins include comfortable beds, linen, cushions and lighting. In addition, the camplodge offers several spacious and stylish bungalows. 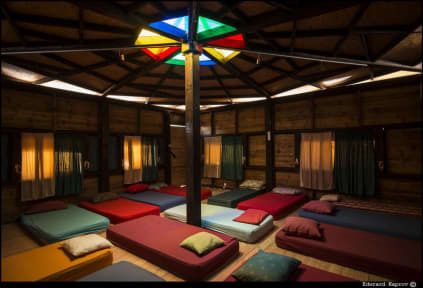 The bungalows include: mats, mattresses and cushions for maximum comfort, heating for those chilly winter nights and very unique lighting for a serene mood. Each bungalow can accommodate up to 15 people - both private bungalow and dormitories. In our campground you will also find clean, roomy and well designed toilets & washrooms (with hot showers), several barbeque grills, seating & dining areas under the acacia trees and an equipped kitchen with a cooking stove, microwave and refrigerators for storing your food and drink. At the end of a full traveling day, you can have a cup of tea by the central bonfire, or enjoy a cold beer in our desert bar. Free WiFi is available within the camplodge as well. In Shkedis CapmLodge youll find a warm and personal hospitality, in a peaceful and pleasant atmosphere where every guest can feel relaxed. If you don't want to prepare your own meals you can dine in one of the small restaurants in our village, located 2 minutes walk from the camplodge. The camplodge is open from September-June and is located 20 minutes from the Dead-Sea shoreline (by car) and 40 minutes from Massada. . In addition to lodging, we also offer guided Jeep tours in an air-conditioned desert vehicle, to take you to those magical places you will not find on the map or be able to reach with a standard set of wheels. Jeep rides can last anywhere from 2 hours up to a full day journey or you can schedule the special moonlight rides. Camping out in the field as part of the Jeep tour can also be arranged upon request. Freedom & loafing - to feel the desert atmosphere go to Shkedis Camplodge! We were pretty positively surprised by the location when we entered the camp for the first time. You get to know local people, chill and enjoy the silence in the hammot. We decided to stay one night longer because of the great vibe at the camp and the hospitality of Jacob and all of the others from staff. Big thanks!! p.s. : If you like luxury hotels, go in a luxury hotel. Beautiful camp site with an amazing decor and atmosphere. Gili is the perfect host and made all the travellers feel right at home. I was there on New Year’s Eve and they cooked an amazing meal for everyone. Definitely a must do! Only stayed for one night, wish I could have stayed longer. Honestly one of the best hostels I've stayed, and I've stayed in a lot. Very relaxed vibe, and everybody was really friendly! Our rental car broke down at night in the desert on our way there and a quick call was all that was needed to ensure there would be somebody up to wait for us. The only "bad" thing I can say is that, for a desert whose nearest large body of standing water is the DEAD SEA, there are a helluva lot of mosquitoes in the AM... but bring repellant and you'll be fine. Stay here. It’ll be one of the best things you’ll ever do.